Summary: How can we coach new teacher leaders as they prepare to lead professional learning activities? In a clear, concise brochure format, this resource outlines a coaching protocol and offers a frame for working with teachers in the early stages of learning to lead professional development. This frame identifies a sequence of face-to-face and email interactions that could easily include other forms of technology to support coaching interactions. 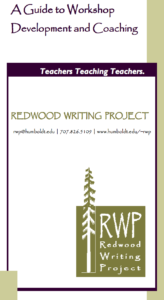 The teachers-teaching-teachers model is a key concept of all Writing Project sites and enterprises. This philosophy extends to the writing teachers do, the curriculum they design, the instructional practices they promote, and the research they conduct. Preparing Teacher Consultants (TCs) during the Invitational Summer Institute (ISI) also includes providing fellows with the opportunity to share their ideas and expertise with others through workshops. These workshops may ultimately be crafted into ongoing staff development and shared with other practitioners. NWP fellows receive support in developing their workshops through coaching. Coaching is an essential component of the Summer Institute and should be part of any professional presentation or workshop sponsored by a Writing Project site. Coaching allows TCs to reflect, deliberate, and make choices about their professional development contributions.